The Internet of Things (IoT) is revolutionising the commercial world. Taking machine to machine (M2M) connectivity to new levels, it is enabling smarter ways of working in many industry sectors, from utilities to transport. With reports forecasting that 21 billion things will be connected by 2020, choosing a scalable, robust and secure network technology is imperative. IoT infrastructure has many challenges particularly when it comes to considering a communication network. As an example, often organisations implement end-to-end silo driven business models, which use a separate communication network and management platform for each application. CyanConnode offers the Omni IoT platform, which is communication protocol, network and transport-layer agnostic. The platform incorporates all the elements required to deliver multi- network, multi-application IoT solutions. A transparent Application Programme Interface (API) enables easy integration with Enterprise Resource Planning (EPR) systems. CyanConnode has the technology and experience to support resilient IoT networks that scale, from single application networks to multi-application, multi-network city wide implementations. 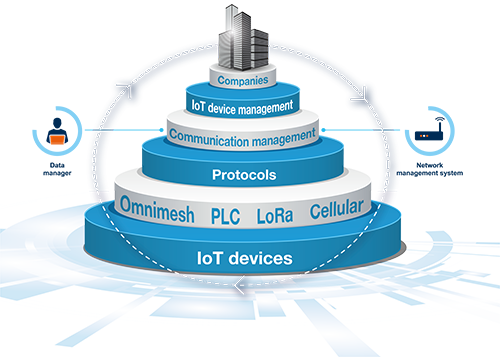 Omni IoT provides a full-service solution for machine to machine (M2M) communication, enabling cost effective communications for long range, low power IoT applications. Supports the management of other network technologies (PLC, LoRa) through one platform. API enables new services to be implemented quickly and cost effectively. Optimal and 6LoWPAN technology has been specifically designed to deliver multi-application, multi-network solutions. Build the network as you deploy the solution, supporting cash flow, deployment, uptime and verification of end to end solution efficiency.